Winter Illumination at Yurakucho (有楽町駅前ウィンターイルミネーション) is one of the light-up shows in Tokyo. 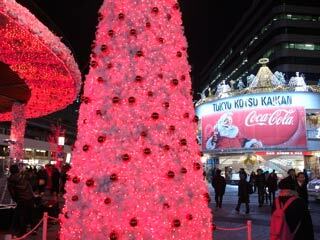 In front of Yurakucho Station will be fully decorated with over 50,000 lights, light towers and dome. Period: from the end of Nov. to the middle of Jan.
Time: from 16:30 to mid-night.